In the late nineteenth and early twentieth centuries, most Americans believed that the best way to help Native Americans was through forced assimilation. Laws and social activists worked to inhibit traditional culture and practices. Allotment was one such attempt to split Shoshone-Bannock land holdings and fracture their culture. After the Native Americans were forced onto reservations, the U.S. Congress was concerned that most tribes had not discontinued collective living. In response, the Dawes Act was passed in 1887 to “allot” reservation lands to individual owners. This meant that the reservations would be divided among the tribe members so that necessity would require them to adopt agriculture. Each reservation was thus partitioned, including Fort Hall. In 1868, Fort Hall was comprised of 1.8 million acres for approximately 4,500 residents. Between 1888 and 1902, the Shoshone-Bannock were pressured to cede away nearly a third of the reservation to the growing town of Pocatello. With the remaining land, each tribe member would receive a certain share. Married couples received 160 acres, single adults 80 acres, and children 40 acres. All of the “excess” was sold by the government. Before any of this could happen, the Shoshone-Bannock requested that all properties have access to irrigation. The first of the irrigation projects was completed in 1911. Between 1911 and 1913, half a million acres were allotted to Shoshone-Bannock tribe members. The remaining 600,000 acres were subsequently sold to non-Natives for a fraction of their worth. Land allotment was divisive in its implementation, but the controversy surrounding the policy has not disappeared in the intervening century. For some, division of tribal lands into individual allotments was an unmitigated economic disaster. Thrown into the turbulence of crop prices and agriculture, many either went hungry or had to sell their land. For another segment of the population, allotment proved an opportunity to successfully experiment with ranching and farming. Local newspapers tended to exaggerate the truth with regards to both the successes and failures of allotment, so it is difficult to reach a historical consensus. Today, 97 percent of Fort Hall is under the control of the tribe or individual Shoshone-Bannock owners. These lands are farmed individually or rented out to local farmers. Map of the Fort Hall Indian Reservation in Idaho : By 1930, the original size of Fort Hall had been cut in half due to forced cessions and the sale of allotted lands to non-Natives. ~ Source: Department of the Interior, Office of Indian Affairs, from the National Archives Catalog. 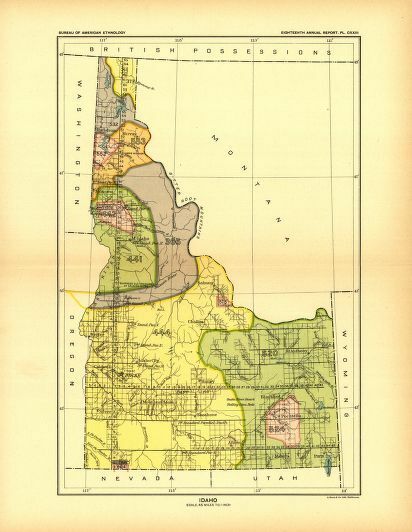 “Map of the Fort Hall Indian Reservation in Idaho,” available at https://catalog.archives.gov/id/6860608. 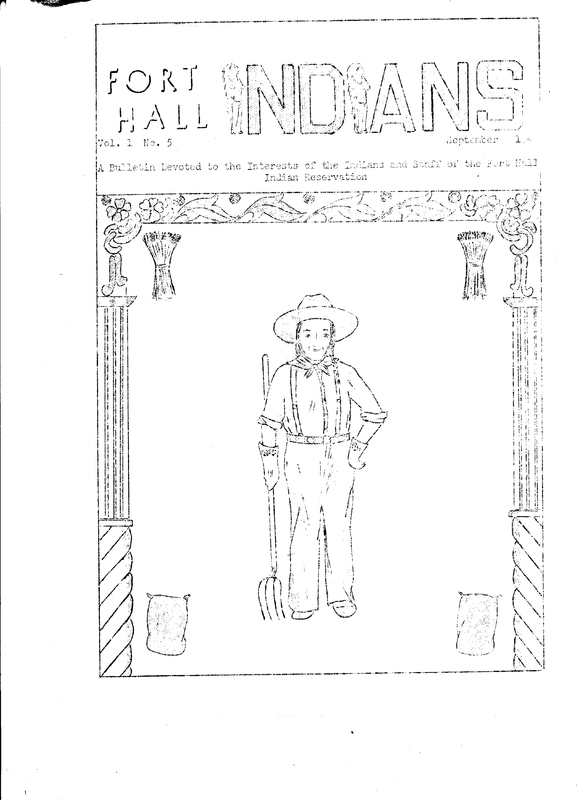 Opening of the Fort Hall Reservation: Frequent newspaper advertisements like this announced the survey and sale of “Indian land” on Fort Hall. ~ Source: The Idaho News. “Opening of the Fort Hall Reservation,” 3 October, 1891. Natalie Larsen, Brigham Young University, “The Division of Fort Hall: Allotment and Land Loss,” Intermountain Histories, accessed April 19, 2019, https://www.intermountainhistories.org/items/show/203. Carlson, Leonard A. Indians, Bureaucrats, and Land: The Dawes Act and the Decline of Indian Farming. Westport, CT: Greenwood Press, 1981. Hanscom, Greg from the High Country News website. “Tribes reclaim stolen lands,” available at https://www.hcn.org/issues/135/4328. Heaton, John W. The Shoshone-Bannocks: Culture and Commerce at Fort Hall, 1870-1940. Lawrence, KS: University Press of Kansas, 2009. The Idaho News. “Opening of the Fort Hall Reservation,” 3 October, 1891. The Idaho Republican. “Still More Leases,” May 2, 1919. Laidlaw, Sally Jean. Federal Indian Land Policy and the Fort Hall Indians. Pocatello, ID: Idaho State College Museum, 1960. Loether, Christopher. “Shoshone-Bannock,” in Native America in the Twentieth Century, edited by Mary B. Davis. New York: Garland Publishers, 1994: 591-592. 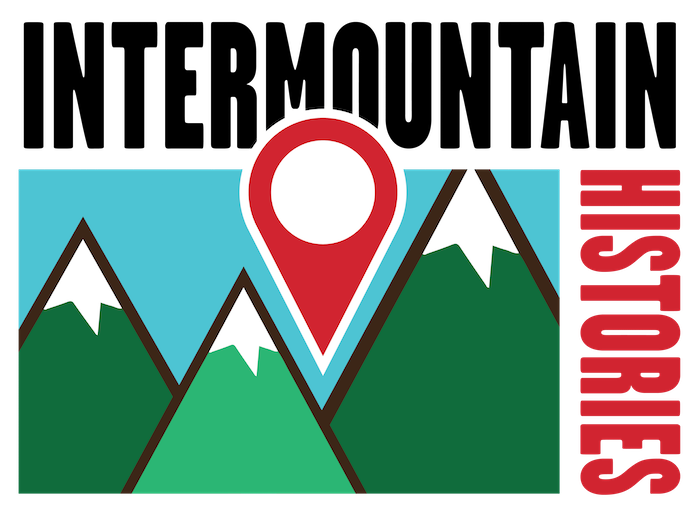 Shoshone-Bannock Tribes Environmental Waste Management Program website. 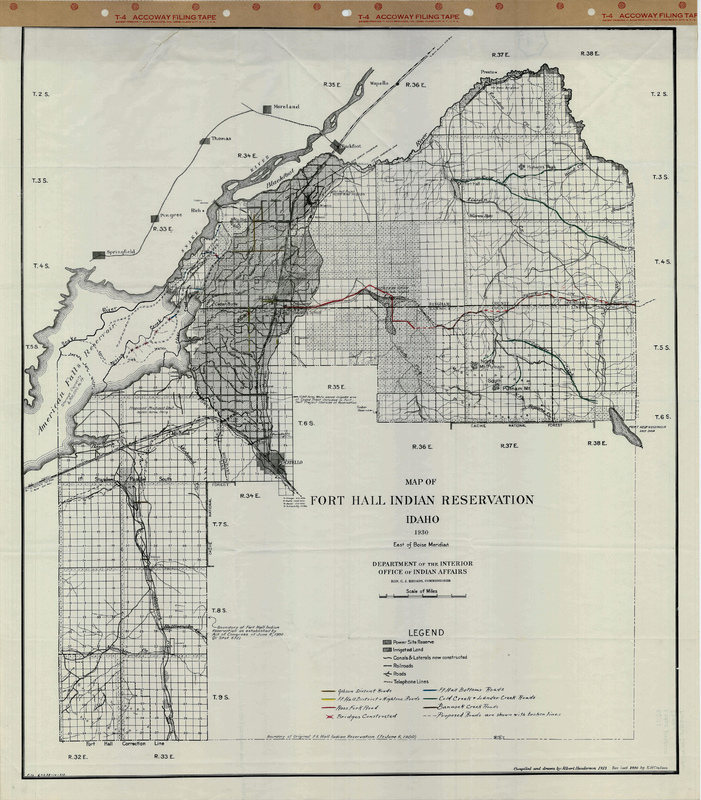 “Fort Hall Indian Reservation Districts,” available at http://sbtribes-ewmp.com/land_base_fort_hall.html. Twin Falls Times.. “Land for Settlers,” 4 February, 1909.